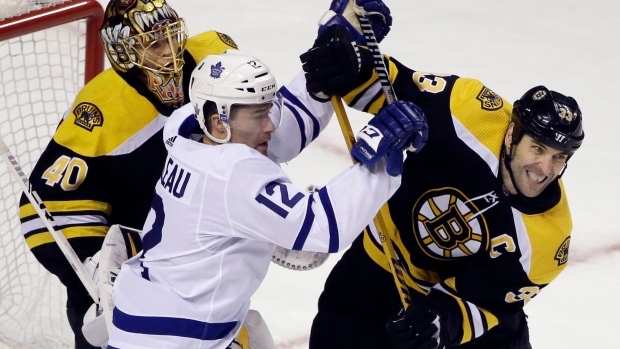 TSN Toronto reporter Mark Masters checks in daily with news and notes on the Maple Leafs. The team skated at SAP Center on Thursday ahead of their game against the San Jose Sharks. The Toronto Maple Leafs had a day off in San Jose on Wednesday and 21-year-olds Auston Matthews and Mitch Marner decided to spend part of it with their 39-year-old teammate Patrick Marleau and his family. Marner chronicled some of the fun on his Instagram account, posting a video of the group singing along to the Village People classic YMCA. "That’s just normal around those guys, yeah," Marleau said with a grin. "That’s just a normal day … They like getting my kids going pretty good. Love having them around, that’s for sure." "I was picking the music," Marner explained. "But, actually, Caleb, his youngest, and Jagger, his second youngest, in the back, they were screaming what songs what they wanted on. It was kind of just songs to see what they’d react to. We were just driving to breakfast and having some fun." Tonight Marleau will play his second game back at the Shark Tank since signing with the Leafs. "It's still a little weird," he admitted, "but definitely a little easier." Last year, the trip was all about gaining closure on his 19 amazing seasons with the Sharks and there was a lengthy video tribute to honour the franchise's scoring leader. "The way the fans reacted and the video tribute that was something I’ll never forget," Marleau recalled fondly. "When it’s happening a lot of thoughts and emotions are going through you and then right away they’re dropping the puck and you don’t want to make a mistake or anything like that. It was definitely challenging." This year, Marleau is using the trip home to build his relationship with his current teammates. What does the friendship with Matthews and Marner mean to him? "It's huge," Marleau said. "They’re guys that are, obviously, really highly talented and the way they approach the game is unbelievable and you want to be around those types of players and people. First and foremost, they’re great people." "It's pretty special," Marner said of his friendship with Marleau. "I don’t think it comes around too often. For me and Auston, we just try and take as much in as we can. He’s got a lot of experience. His family is awesome. It’s a lot of fun being around him and no matter where we are they have no problem inviting us." On the surface, the mild-mannered Marleau may seem to have little in common with his fashion-forward, social media-savvy friends, but when it comes to hockey they're quite similar. They all own a high hockey IQ and all love the game. "It doesn't surprise me at all," said Sharks captain Joe Pavelski when asked about Marleau's ability to bond with younger teammates. "He's always been great with everybody in the room and he’s always had a lot of fun ... We’re happy for Patty. You can see it. It’s fun to watch. That’s why he’s still in the league. That’s why he’s knocking on 1,600 games. He just enjoys coming to the rink as much as anyone." "He enjoys it," Marner agreed. "I think, also, his family enjoys it as well. His family enjoys watching him play hockey and I think that makes him want to play even longer." That love for the daily grind is one thing Leafs head coach Mike Babcock is hoping will rub off on his younger players. He compares Marleau to his former captain in Detroit, Nicklas Lidstrom. "They embrace the monotony of the game better than anyone else," Babcock said. "In other words, they don't get bored with it, they don’t get bitter with it, they just seem to love it and whether that be taping their stick or getting their hot pack or doing up their skates or going out or enjoying the bus rides. I think you got to enjoy it and I think you got to sit back and take a look from the outside in, as all of us should, at how lucky you are to be playing a game as a man." That’s why Marleau’s value can’t be charted in simple statistics. He has three goals in 18 games this season putting on pace for just 14 tallies, which would be Marleau's lowest total since his rookie season. But he continues to contribute as a living, breathing road map to success. "When you watch a guy who doesn’t say much, just comes to work every single day, does it right, trains right, lives right, doesn’t complain, enjoys the league, enjoys every day in it and is getting ready to play his 1,600th game, it’s a good example for you," said Babcock. "Rather than some coach telling you, this is just a guy living it every day. And if you want to measure yourself and where you are going, we have a lot of young guys who have a chance to have good careers if they want to do it right." Marner, for one, seems to have embraced that message. His admiration and respect for Marleau has gotten to the point where he’ll eschew the usual hockey cliche – approach every game like it’s the same – and talk openly about wanting to win tonight for his friend. "It's a big game for Patty," Marner said. "We want to play well for him. We didn't play well last time ... we need to make up for it this time." The Leafs lost 3-2 in San Jose last year (Oct. 30, 2017) getting outshot 39-18. Wearing a regular sweater, Matthews joined his teammates on the ice at the start of the morning skate on Thursday marking his first workout with the full group since injuring his left shoulder on Oct. 27. However, Matthews didn’t take part in any line drills. Asked for an update on the status of his No. 1 centre, Babcock said not much has changed. And the coach also warned reporters not to get the hype train rolling too fast. "It doesn't matter where you are when you come back, it's the NHL, it’s a fitness league, everyone else is bumping and grinding and you have to get back up to pace," he said. “And then right away all eyes are on you with how you play and so the more time he can spend getting ready … that allows you to be prepared when you come back or at least more prepared." Saturday will mark three weeks since Matthews sustained the injury via a big hit from Winnipeg Jets defenceman Jacob Trouba. The team previously announced Matthews would be out at least four weeks. Toronto's next practice is scheduled for Sunday back in Toronto. Acquired in a blockbuster deal with Ottawa before the season, defenceman Erik Karlsson hasn’t produced as expected early in his Sharks career. He has just eight assists through 19 games with only three coming at even strength. "His game is trending in the right direction," head coach Peter DeBoer insisted. "I think he’s been good. When you look at the underlying numbers of what he's doing here, they're as good or better than they were two years ago in Ottawa when he led them to the (brink) of the Stanley Cup final and was winning the Norris and was one of the leading scoring defencemen in the league. So, all those things are there and it just hasn’t broke the right way for him yet. We have to ignore the noise that you guys create and keep doing what we do." Karlsson is averaging 2.8 shots per game, which is slightly up from last season and equal to his pace two years ago. The Sharks, meanwhile, are dominating possession with Karlsson on the ice in five-on-five play (60% Corsi For). So, why hasn’t the offence been there? Fellow defnceman Brent Burns has a theory. "He’s a world-class player," Burns said. "The things that he can do, it’s just, it’s incredible. It takes time for everybody else to kind of know what he’s doing. He’s thinking the game at another level. It’s a different system, too, so it takes time." You also can't discount the fact that Karlsson, in a contract year, has been forced to uproot his family and move across the continent after an emotional split from the Senators. "I mean it’s everything," said Burns, who dealt with his own trade earlier in his career. "Your daily routine, your coffee place, your grocery store, your restaurant. I think the majority, if not all of us, are pretty routine creatures and you get into that routine for 10 years, it’s tough. I think just little extra stresses in your life. It takes time." "It’s human nature," said DeBoer. "You want to come in, you want to make an impact, you want to show people what you can do, you want to help your new team. All those things can weigh on you, but sometimes you have to take a step back and look at what’s actually going on and the reality of that. And the reality is a lot of very good things are going on it just hasn’t resulted in points on the scoresheet yet. But that’s around the corner. Trust me on that. We’re going to sit and have this conversation again and you guys will forget everything you’ve written in the last month and say, ‘I knew it was coming,’ like you always do." Karlsson has 35 points in 36 career games against the Leafs, which is more than any other opponent. The Sharks were among the teams wooing John Tavares in the free-agency period last summer. They ultimately came up short, but that hasn’t diminished the high esteem with which DeBoer holds the 28-year-old centre. "John Tavares, for me, is one of the best players in the world, playing with a lot of confidence," the Sharks coach said. "I just love the honesty to his game. He plays both ends of the rink. He wins battles. He goes to the dirty areas of the rink." Despite adjusting to a new team, Tavares has been able to post 11 goals and 11 assists in 18 games. DeBoer was involved with San Jose’s pitch to Tavares and came away impressed with the star’s preparedness. "It was exactly what I thought John Tavares would ask. I don’t know him really well, but I’ve had him on some different teams at the world championship level, world juniors, very prepared, very educated. There was no fluff to the questions. He was to the point and that’s how he plays, too."